I wanted to do my very first DIY costume. So, I went online and googled DIY costumes and to my surprise your website popped up. 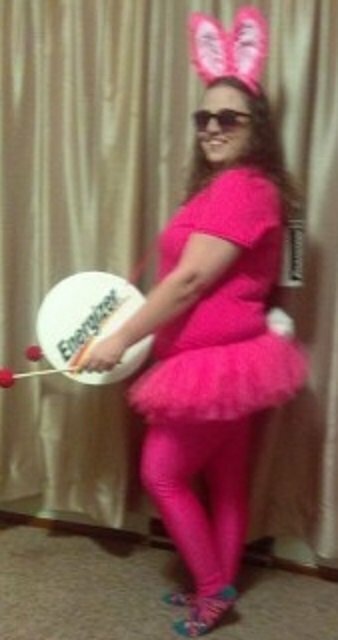 I went and looked through the costumes people had posted and found the Energizer Bunny. I thought it was such a cute idea and it seemed pretty easy to make. After talking to my husband about helping me make it, he said he was thrilled to help me paint the battery and drum. The Energizer Bunny Halloween costume I found on your site wasn’t too girly. I decided to make it girly for my taste. I started with a hot pink t-shirt, hot pink leggings and a hot pink tutu. I then bought a regular size can of Pringles chips and a small Gatorade. My son was thrilled to help me out by eating the chips and drinking the Gatorade. I cut a hole in the lid of the Pringle can the same size as the lid on the Gatorade bottle. Then, I put the empty Gatorade bottle inside the empty Pringle can. Next, I put the Gatorade lid through the hole on the Pringle lid. I printed up a label from the computer for the battery and the drum. I had my husband spray paint the Pringle can gray. Then I super glued the label to the Pringle can and used safety pins to attach it to the back of the shirt. For the drum I went to Joann Fabrics. I found a round box with a lid (I got lucky it was on clearance). I also got pink ribbon to make the strap for the drum and red duct tape to do the zigzag pattern on the drum. Then I had my husband spray paint the round box white for me. I cut slits into each side of the round box, one on the lid side and the other on the box side, so I could run the pink ribbon through it. Then I super glued the energizer label onto the drum. I finally used the red duct tape to make a zigzag pattern on the side of the box. For the drumsticks I bought small wooden dowels from Wal-mart along with red paint and styrofoam balls. Painted the balls red and when dried I pushed them into the wooden dowels. I also purchased dark black sunglasses from Wal-mart to complete my costume. I kept telling all my friends I was doing a DIY costume, they kept asking me what I was being and I would say they’d have to wait til the Halloween party to see it. In addition, I was also telling regular customers where I work what I was going as and that I made it myself. They all said it sounded cute and wanted to see pictures afterwards. I went to the Halloween party and everyone loved it. People where coming up to me and telling me how cute and unique it was. When I told them what the battery on my back was made of they really took a closer look and were amazed. So glad I decided to do a DIY costume this year, now I’m already thinking of what to do next year.